The WVDL and our state and federal collaborators would like to remind veterinarians and producers to use caution when working with animals with confirmed or suspected multidrug resistant (MDR) Salmonella enterica subspecies enterica serotype Heidelberg. 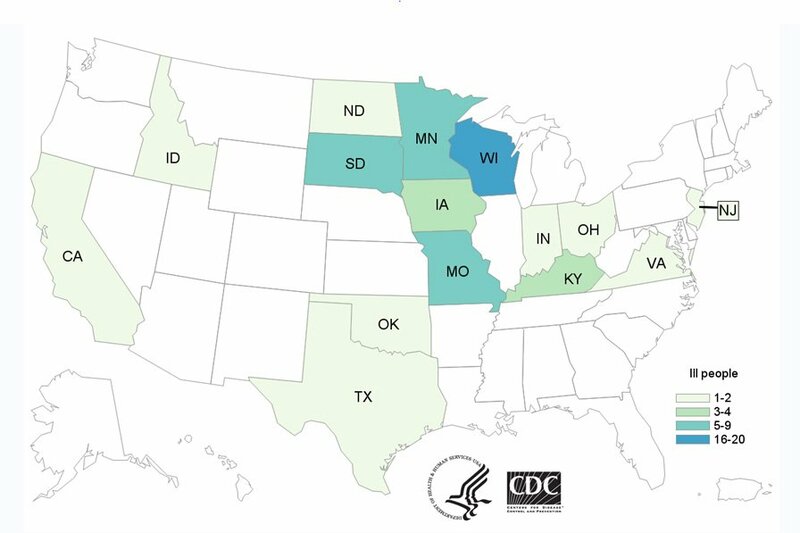 To date, there are 54 confirmed human infections in 15 states (n=18 in Wisconsin; Figure 1), in which 35% (n=17) of infected people have been hospitalized and 15% (n=8) had invasive disease. Moreover, 33% (n=18) of ill persons were under the age of 5 years. 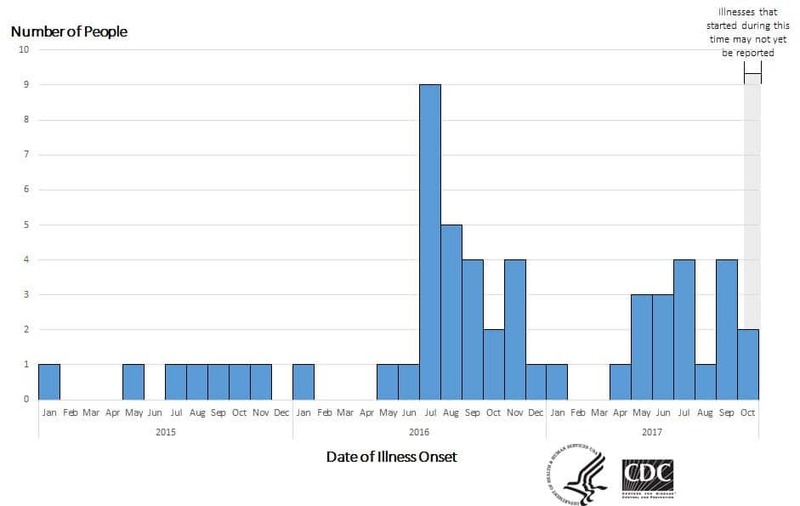 There continues to be human infections with MDR Salmonella ser. Heidelberg (Figure 2) where 63% (n=34) reported having contact with cattle including ill dairy beef calves. The Center for Disease Control and Prevention (CDC) has updated their website (https://www.cdc.gov/salmonella/heidelberg-11-16/index.html) and provide several documents related to advice and information for livestock handlers, veterinarians and healthcare providers. The WVDL continues to isolate MDR Salmonella ser. Heidelberg from bovine tissues and feces. We would like to stress the importance of cleaning and disinfection when this MDR Salmonella has been identified on a premise. Preliminary evidence suggests that even after 1-2 years post identification of a MDR Salmonella ser. Heidelberg on a premise, we are able to culture Salmonella ser. Heidelberg from one or more locations on that premise. Below are the number of MDR Salmonella ser. Heidelberg cases that the WVDL has identified from 2009 to 2017 (U.S. and Wisconsin maps). As expected Wisconsin has the most number of isolates at 61 with Missouri at 33 (Figure 3). Additionally, Barron County (n=10) has the most isolates followed by Marinette and Shawano Counties (n=6 each) and Grant County (n=5) (Figure 4). The data here is a gross under estimation of the true burden of disease. The WVDL provides information about cleaning and disinfection protocols, bovine environmental sampling instructions, Salmonella molecular and culture testing options and work flow and a Salmonella ser. Heidelberg interview questionnaire on our website in the Diagnostic Aids tab. Figure 3: Map of Salmonella ser. Heidelberg isolates by State from 2009-2017. 2) The Inform 2017 Conference on November 8 in Garden Grove, Calif. Additionally, a USDA veterinarian talked about preliminary data from a case control study the WVDL is participating in. 3) The One Health Symposium on November 10 in Madison, Wis.
4) The Conference of Research Workers in Animal Diseases (CRWAD) in Chicago, Ill. on December 5.